Your Personal Gifting Expert | Personalized Gifts, Baskets and More! Please review our Privacy Notice, which also governs your visit to LaBellaBaskets.com, to understand our practices. When you visit LaBellaBaskets.com or send emails to us, you are communicating with us electronically. You consent to receive communications from us electronically. We will communicate with you by email or by posting notices on this site. You agree that all agreements, notices, disclosures and other communications that we provide to you electronically satisfy any legal requirement that such communications be in writing. All content included on this site, such as text, graphics, logos, button icons, images, audio clips, digital downloads, data compilations, and software, is the property of La Bella Baskets or its content suppliers and protected by United States and international copyright laws. The compilation of all content on this site is the exclusive property of La Bella Baskets and protected by U.S. and international copyright laws. All software used on this site is the property of La Bella Baskets or its software suppliers and protected by United States and international copyright laws. La Bella Baskets grants you a limited license to access and make personal use of this site and not to download (other than page caching) or modify it, or any portion of it, except with express written consent of La Bella Baskets. This license does not include any resale or commercial use of this site or its contents; any collection and use of any product listings, descriptions, or prices; any derivative use of this site or its contents; any downloading or copying of account information for the benefit of another merchant; or any use of data mining, robots, or similar data gathering and extraction tools. This site or any portion of this site may not be reproduced, duplicated, copied, sold, resold, visited, or otherwise exploited for any commercial purpose without express written consent of La Bella Baskets. You may not frame or utilize framing techniques to enclose any trademark, logo, or other proprietary information (including images, text, page layout, or form) of La Bella Baskets.com and our affiliates without express written consent. You may not use any Meta tags or any other "hidden text" utilizing La Bella Baskets name or trademarks without the express written consent of La Bella Baskets. Any unauthorized use terminates the permission or license granted by La Bella Baskets. You are granted a limited, revocable, and non-exclusive right to create a hyperlink to the home page of your LaBellaBaskets.com site so long as the link does not portray La Bella Baskets, or its products or services in a false, misleading, derogatory, or otherwise offensive matter. You are authorized to use any La Bella Baskets.com banner found in the marketing tools as part of the link. If you use this site, you are responsible for maintaining the confidentiality of your account and password and for restricting access to your computer, and you agree to accept responsibility for all activities that occur under your account or password. La Bella Baskets does sell products for children, but it sells them to adults, who can purchase with a credit card. If you are under 18, you may use La Bella Baskets only with involvement of a parent or guardian. La Bella Baskets reserves the right to refuse service, terminate accounts, remove or edit content, cancel orders or accounts at its sole discretion. Visitors may post reviews, comments, and other content; send e-cards and other communications; and submit suggestions, ideas, comments, questions, or other information, so long as the content is not illegal, obscene, threatening, defamatory, invasive of privacy, infringing of intellectual property rights, or otherwise injurious to third parties or objectionable and does not consist of or contain software viruses, political campaigning, commercial solicitation, chain letters, mass mailings, or any form of "spam." You may not use a false email address, impersonate any person or entity, or otherwise mislead as to the origin of a card or other content. La Bella Baskets reserves the right (but not the obligation) to remove or edit such content, but does not regularly review posted content. If you do post content or submit material, and unless we indicate otherwise, you grant La Bella Baskets a non-exclusive, royalty free, perpetual, irrevocable, and fully sublicensable right to use, reproduce, modify, adapt, publish, translate, create derivative works from, distribute, and display such content throughout the world in any media. You grant La Bella Baskets the right to use the name that you submit in connection with such content, if they choose. You represent and warrant that you own or otherwise control all of the rights to the content that you post; that the content is accurate; that use of the content you supply does not violate this policy and will not cause injury to any person or entity; and that you will indemnify La Bella Baskets for all claims resulting from content you supply. La Bella Baskets has the right but not the obligation to monitor and edit or remove any activity or content. La Bella Baskets takes no responsibility and assumes no liability for any content posted by you or any third party. All items purchased from La Bella Baskets are made pursuant to a shipment contract. This means that the risk of loss and title for such items pass to you upon our delivery to the carrier. La Bella Baskets attempts to be as accurate as possible. However, La Bella Baskets does not warrant that product descriptions or other content of this site is accurate, complete, reliable, current, or error-free. If a product offered by La Bella Baskets itself is not as described, your sole remedy is to return it in unused condition. THIS SITE IS PROVIDED BY La Bella Baskets ON AN "AS IS" AND "AS AVAILABLE" BASIS. La Bella Baskets MAKES NO REPRESENTATIONS OR WARRANTIES OF ANY KIND, EXPRESS OR IMPLIED, AS TO THE OPERATION OF THIS SITE OR THE INFORMATION, CONTENT, MATERIALS, OR PRODUCTS INCLUDED ON THIS SITE. YOU EXPRESSLY AGREE THAT YOUR USE OF THIS SITE IS AT YOUR SOLE RISK. TO THE FULL EXTENT PERMISSIBLE BY APPLICABLE LAW, La Bella Baskets DISCLAIMS ALL WARRANTIES, EXPRESS OR IMPLIED, INCLUDING, BUT NOT LIMITED TO, IMPLIED WARRANTIES OF MERCHANTABILITY AND FITNESS FOR A PARTICULAR PURPOSE. La Bella Baskets DOES NOT WARRANT THAT THIS SITE, ITS SERVERS, OR EMAIL SENT FROM La Bella Baskets ARE FREE OF VIRUSES OR OTHER HARMFUL COMPONENTS. La Bella Baskets WILL NOT BE LIABLE FOR ANY DAMAGES OF ANY KIND ARISING FROM THE USE OF THIS SITE, INCLUDING, BUT NOT LIMITED TO DIRECT, INDIRECT, INCIDENTAL, PUNITIVE, AND CONSEQUENTIAL DAMAGES. By visiting LaBellaBaskets.com, or purchasing products from or otherwise doing business with La Bella Baskets, you agree that the laws of the state of Texas, without regard to principles of conflict of laws, will govern these Conditions of Use and any dispute of any sort that might arise between you and La Bella Baskets. Any dispute relating in any way to your visit to LaBellaBaskets.com or to products you purchase from La Bella Baskets shall be submitted to confidential arbitration in Austin, Texas, except that, to the extent you have in any manner violated or threatened to violate La Bella Baskets intellectual property rights, La Bella Baskets may seek injunctive or other appropriate relief in any state or federal court in the state of Texas, and you consent to exclusive jurisdiction and venue in such courts. Arbitration under this agreement shall be conducted under the rules then prevailing of the American Arbitration Association. The arbitrator's award shall be binding and may be entered as a judgment in any court of competent jurisdiction. To the fullest extent permitted by applicable law, no arbitration under this Agreement shall be joined to an arbitration involving any other party subject to this Agreement, whether through class arbitration proceedings or otherwise. Site Policies, Modification and Severability Please review our other policies, such as our Terms and Conditions posted on this site. These policies also govern your visit to LaBellaBaskets.com. We reserve the right to make changes to our site, policies, and these Conditions of Use at any time. If any of these conditions shall be deemed invalid, void, or for any reason unenforceable, that condition shall be deemed severable and shall not affect the validity and enforceability of any remaining condition. Member may not use his or her knowledge, or association with other Members to compete against La Bella Baskets. However, Members may partner with companies for the purpose of marketing or selling products from their Member sites. This would include, but not be limited to, Online Auction sites, traffic promotion sites, etc. Member agrees that he or she is an independent contractor, and not an employee, agent, partner, legal representative, or franchisee of La Bella Baskets. Member further agrees not to incur any debt, expense, and obligation on behalf of, for, or in the name of La Bella Baskets. 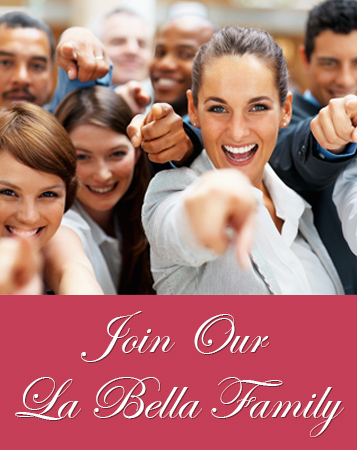 Applications for Member status are subject to approval by La Bella Baskets. Member must be of legal age in his/her state. Members will be issued a "Member Link", or unique URL, which allows La Bella Baskets to identify visitors from Member site as originating from Member. These visitors are tracked with this unique URL and sales are recorded with the appropriate Member ID. To receive commissions, Member must use the provided Member Link. The URL may be in various forms such as a banner, image, or text link. Member is solely responsible for ensuring that his or her Member Link is set up properly to qualify for commissions. La Bella Baskets is not responsible for acts by third parties, or other events outside our reasonable control, which may temporarily disrupt or diminish Member’s service. Member shall follow La Bella Baskets advertising guidelines and agrees not to misrepresent La Bella Baskets products or services. La Bella Baskets shall not be held liable for any indirect, incidental, special or consequential damages or any loss of revenue or profits arising under or with respect to these terms and conditions or the Program, irrespective if La Bella Baskets has been advised of the possibility of such damages. La Bella Baskets aggregate liability arising under or with respect to the Terms and Conditions and/or the Program shall in no event exceed the total commissions paid or payable by La Bella Baskets under this agreement. La Bella Baskets makes no warranties, expressed or implied, with regard to the Program except as outlined in the Terms and Conditions. In the event that a provision in the Terms and Conditions is held to be invalid or unenforceable, such provision shall be reformed only to the extent necessary to make it enforceable, and the balance of the Terms and Conditions will remain in full force and effect.